Hard work, preparation and brain power lead Marshall Middle School participants to win first, second and third place in the regional Science Championship. The competition was held Feb. 19 in Los Angeles. Students qualified by taking a quiz locally on the same day and time, as all hopeful participants across the country. Of the 25 Marshall Middle School students who took the quiz, nine students qualified for the regional competition. The regional competition contained questions from the categories of physics, chemistry, biology, computers and math. Students competed individually in the buzzer-style competition with others of their own grade or grade group. Cheryl Converse-Rath, advisor to both the Science Championship and the Academic Quiz Bowl for Marshall Middle School, said she discovered the competition for the first time this year. Converse-Rath said she established a weekly practice schedule and used the provided practice packets to prepare the students for the competition. The results speak for themselves. In the eighth-grade group, Alec Malcangio, Shreya Goel and Shabdika Gubba placed first, second and third. Notably, sixth grader Anya Krolik won first place in her group as well. 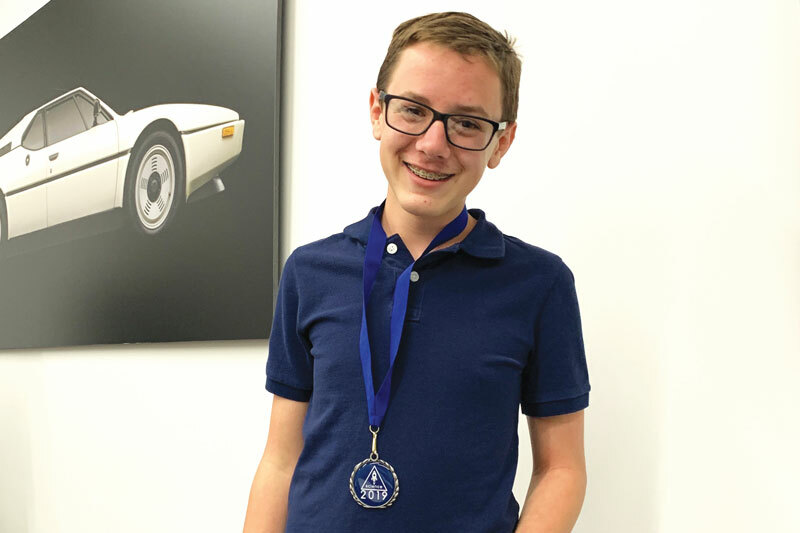 Eighth grade first place winner Alec Malcangio said he felt most prepared by the practice sessions held by Converse-Rath that gave him a good sense of both the types of questions that would be asked and how in-depth to expect the questions to go. “I felt fairly confident going through the competition. I was asked a number of more traditional science questions, namely in physics and geology, that were heavily covered in the prep-packets,” Malcangio said. Despite feeling prepared, Malcangio said he had no expectation of winning the competition. “I really didn’t expect to win. When I finished first, I was completely surprised and I was in shock for a while,” he said. Converse-Rath was thrilled with the students’ remarkable finish and plans to spread the word and promote the event even more for next year’s competition. “I think the students’ finish is fantastic. How exciting is it that in the first year we competed we have five students who qualified for the national championship?” she said. The National Science Championship takes place in Atlanta Georgia in June. While Malcangio qualified for the national championship, he said he won’t be attending because it takes place during his eighth-grade graduation. Imagine solving a who-done-it, building a battery-operated robot or proving your knowledge in a specialized area of science. Now imagine being able to do that in middle school. Ninety students of Thurgood Marshall Middle School do just that when they compete annually in the Science Olympiad. Karla McCalmont, one of Thurgood Marshall Middle School’s 46 Science Olympiad assistant coaches, is a chemist by trade. She serves as the coach for the Crime Busters event in the competition. Science Olympiad, McCalmont explained, is comprised of 23 events that fall into three distinct categories: study events, lab events and build events. Crime Busters falls into the lab events category with much to accomplish in a short amount of time. 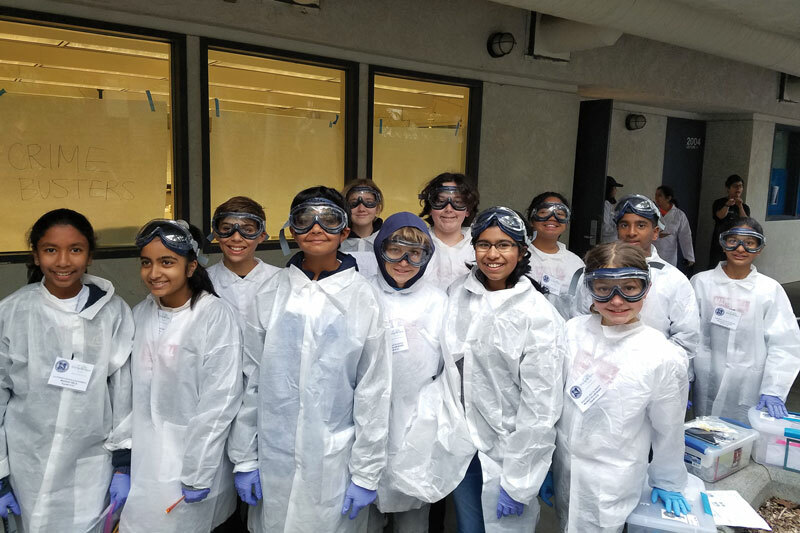 “In the case of Crime Busters, you have a mock crime scene scenario: students are given evidence and they have 50 minutes to discover metals and liquids, figure out which evidence points to what suspects and write an analysis showing their conclusion,” McCalmont said. The topics range from life science, earth science and physical science to technology and experimental design. Marshall Middle School students participating each compete in three or four separate events. For the majority of the events, the participants are placed into teams based on their application which denotes their preference for particular events. According to McCalmont, the participants meet weekly with their coaches for each of their assigned events from October through February. While there were some smaller invitational events that helped the participants gain their competition sea legs, the main event of the year is the annual San Diego Regional Tournament. Thurgood Marshall Middle School has placed in the top 10 schools for the past 12 years, and this year was no different. Competing on Feb. 9, Thurgood Marshall Middle School placed fifth out of 32 schools and 112 teams. This remarkable finish solidifies their spot at the California State Science Olympiad competition to be held on April 6. McCalmont said participating in Science Olympiad gives participants the opportunity to take a deep dive on a topic they really enjoy. “Science Olympiad provides a chance for students to try out an area mentioned maybe once or twice in class work with much more detail. It also provides a venue for better communication skills and working with a partner. The kids learn how to delegate each task to their strong suits,” she said. Only 15 students from the 90 Marshall Middle School participants will be selected for state competition and, according to McCalmont, they may face events for which they have never prepared. This year, however, their self-selected team names should at least make them feel battle ready: Hela, Killmonger, Loki, Thanos, Ultron and Venom are all monikers shared with powerful villains from the Marvel universe. For more information, visit scilympiad.com/san-diego-so. 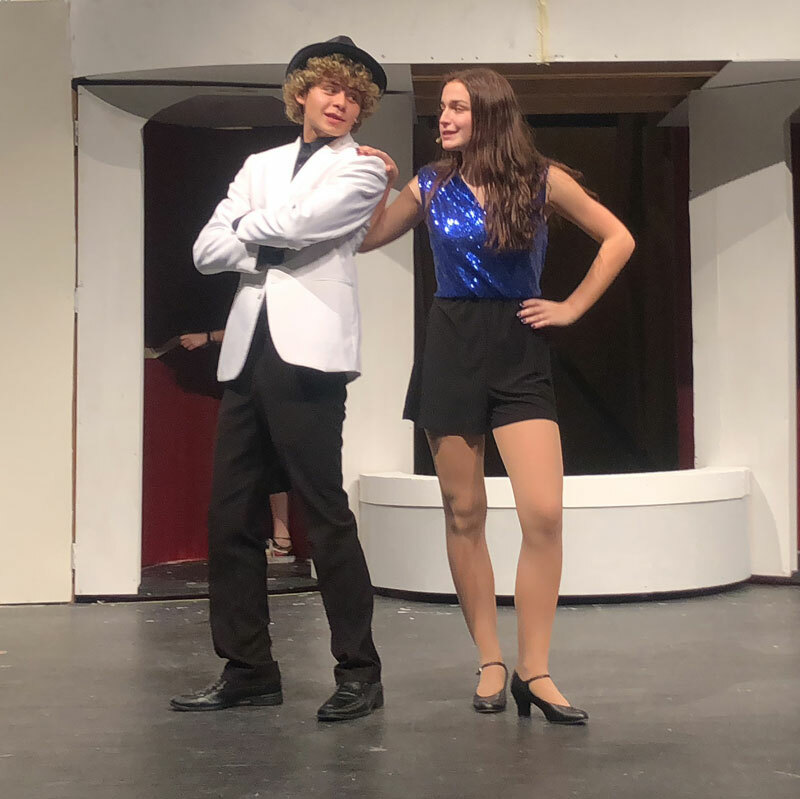 Fans of song and dance are in for a treat when the students of the Scripps Ranch High School’s Falcon Playhouse present their staging of the classic American musical “Anything Goes,” beginning Feb. 28 at the school theater. The timeless story of the play follows nightclub singer and evangelist Reno Sweeney and her friend Billy Crocker as they travel onboard the SS American. Billy is in love with Hope Harcourt, who is engaged to the wealthy Lord Evelyn Oakleigh. With the help of a hapless gangster and the girlfriend of a man regarded as public enemy no. 1, Billy sneaks aboard hoping – with the help of elaborate disguises, tap-dancing sailors and good old-fashioned blackmail – to stop the wedding and sweep Hope away for himself. A classic play that has remained popular throughout the country, “Anything Goes” premiered on Broadway in 1934. It has been made into a film and has been reproduced on stage both on and off-Broadway, including as part of a national tour, and at high school and community theaters. 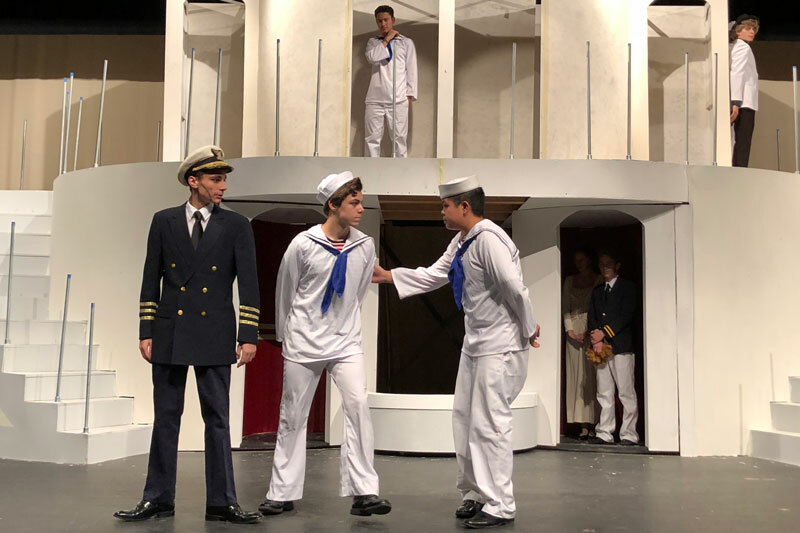 SRHS Theatre Director Patrick Garcia noted that students will be presenting the 1987 version of the production, which features extended musical sections. “The ‘Anything Goes’ number is a little longer, and several of the other numbers have longer dance breaks,” he said. Lead actors in the play will be Mackenzie Cain as Reno Sweeney; Luke Lima as Billy Crocker; Maia Fram as Hope Harcourt; Griffin Herring as Lord Evelyn Oakleigh; Dylan Darwish as Moonface Martin; Genevieve Flores as Erma Latour; and Shayan Nowzari as Elisha Whitney. Garcia said “Anything Goes” is one of the student playhouse’s biggest productions. The play has a cast of 45, including the leads, another 35-40 people working as crew and 12 musicians to provide the live music. And it’s all student-run. Showtimes and dates for “Anything Goes” will be 6:30 p.m. on Feb. 28, and March 1, 2, 7, 8 and 9. Matinee shows will be at 1 p.m. on March 2 and 9. Tickets can be purchased at the Falcon Playhouse box office after school hours, at the door prior to each showing or online at bit.ly/2GhNUQo. Ellen Browning Scripps Elementary School is hosting a community-wide chess tournament for youngsters on Thursday, Feb. 28. All students in Scripps Ranch in kindergarten to sixth grade are welcome to enter this informal tournament. Cost is $20 per competitor, and a sibling discount is available. The event is open to players of all skill levels. 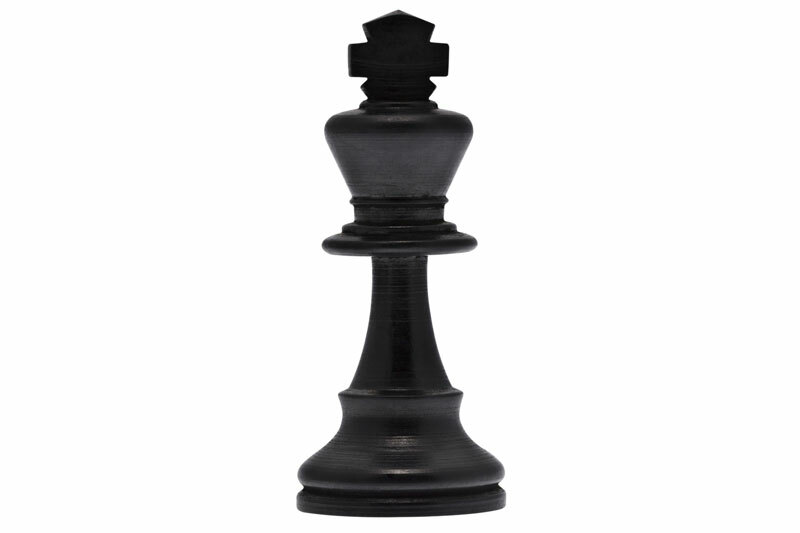 The Scripps Ranch Chess Tournament will be held at Ellen Browning Scripps Elementary, 11778 Cypress Canyon Road, in the Multi-purpose room starting at 6 p.m. and ending at 8:45 p.m.
Pizza and Refreshments will be on sale. Trophies will be awarded to the top four players in each age group. Doors open at 6 p.m. Games begin at 6:30 p.m. and the awards will be presented at 8:45 p.m.
For more information, email info@afterschoolchessclub.com or call (858) 461-8616. 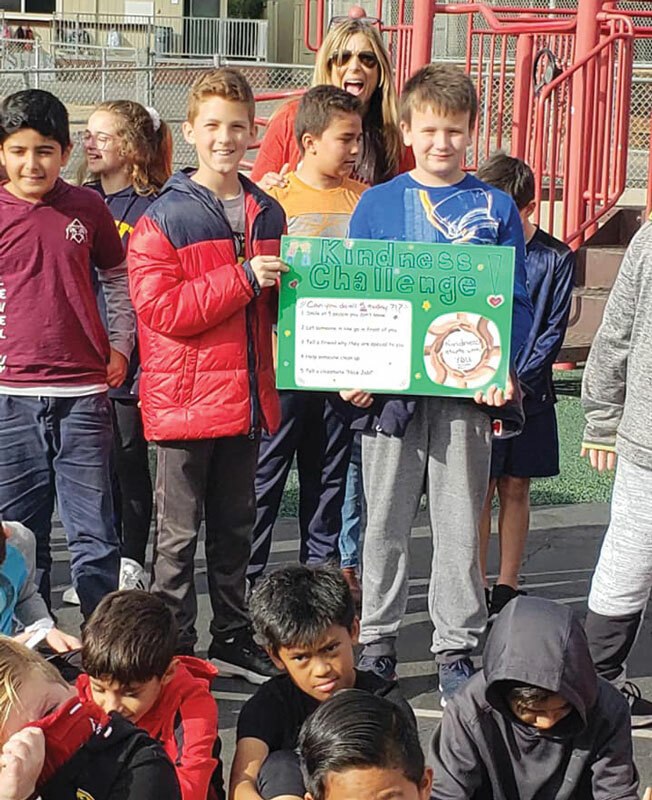 Jerabek Elementary School celebrated Kindness Week Jan. 14-18 with the goal of creating and sustaining a culture of kindness in which students treat themselves, peers, teachers, their families and the environment with kindness, care and compassion. Teachers provide tools for classroom activities stressing the theme of kindness. “Get Caught Being Kind Cards” were available around campus and students could be caught being kind and given a card. The cards could be redeemed for items such as Kindness Jelly bracelets, a kindness coin or temporary tattoos. The week culminated with a Kindness Rally with a DJ and also special guest Greg Camarillo, a retired NFL player, who spoke with the kids about the importance and impact of kindness. 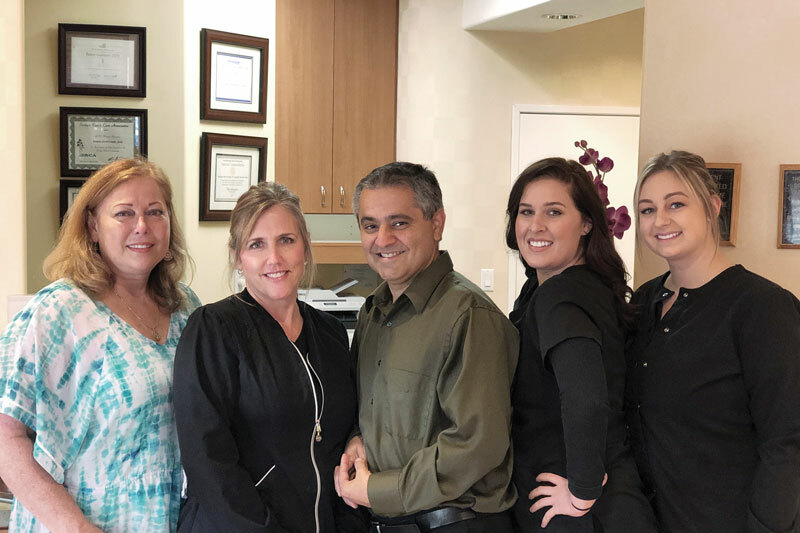 The Miramar Ranch Elementary Family Faculty Association (FFA) invites parents to join in an evening of Greek decadence at the annual Spring Social and Fundraiser. 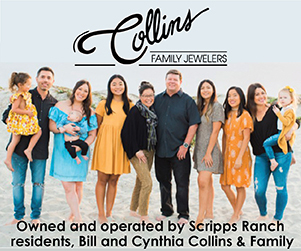 Enjoy dinner and dancing with parents, faculty and friends of the school at Mission Trails Regional Park, 1 Father Junipero Serra Trail. All proceeds will benefit the students of Miramar Ranch Elementary School. Adults only. The Spring Social is scheduled for Saturday, April 27, 7-10 p.m. Visit mrespringsocial.com for more information and to buy tickets. St. Gregory the Great Catholic School welcomed many visitors to its recent Open House, which kicked-off the school’s annual celebration of Catholic Schools Week. 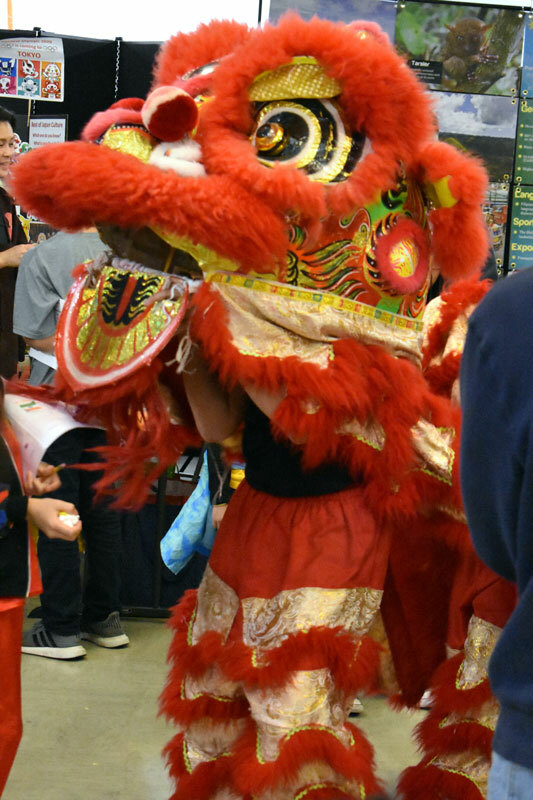 Students showed their Guardian spirit and hospitality, welcoming more than 200 guests to Lunch with a Loved One; demonstrated their creativity in designing and painting a tile for the 10th Anniversary Legacy Tile Project; celebrated diversity by sharing their heritage and traditions during Cultural Heritage Day; and supported the American Heart Association by raising funds through the Kids Heart Challenge. In addition, “bees” were buzzing as students participated in the school-level Scripps National Spelling Bee. Eighth grader Patrick O’Leary won by spelling the word “gondolier” correctly. Other winners include National Geographic GeoBee, fifth-grader Luke Parker; and the school’s Religion Bee, sixth-grader Adriel Reomales controlled the board for first place. Congratulations go to Patrick O’Leary who also won the Chapter, and beat out 10 other chapters, to win the District XIV level in the Daughters of the American Revolution (DAR) essay contest with his essay based on “The Women’s Suffrage Campaign.” O’Leary has also been busy as captain of the Academic Decathlon team. Congratulations also go to kindergartener Isabella Coombs, who placed first in the Diocese of San Diego’s Catholic Schools Week Coloring Contest. Enrollment in all grades, preschool through grade 8, for the 2019-2020 school year has begun. For information about preschool, call (858) 397-1291. 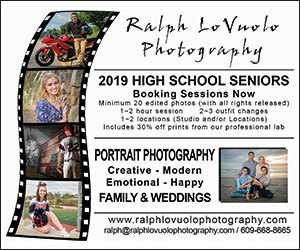 For K-8 school, call (858) 397-1290. A local team of tech-talented students representing Scripps Ranch High School Feb. 16 in the finals of the 10th annual SoCal Cyber Cup Challenge, a competitive event designed to encourage and support student interest in the field of cybersecurity, captured first place in the high school division. The event is produced by the San Diego Chapter of the National Defense Industrial Association (NDIA). The SoCal Cyber Cup Challenge gave students a chance to apply theories and practical skills they have learned, while also fostering a spirit of teamwork, ethical behavior and effective communication both within and across teams. Open to all high school and middle school students in San Diego, Imperial, Orange, Riverside and San Bernardino counties, nearly 400 students participated in the Cup’s qualification round this year. 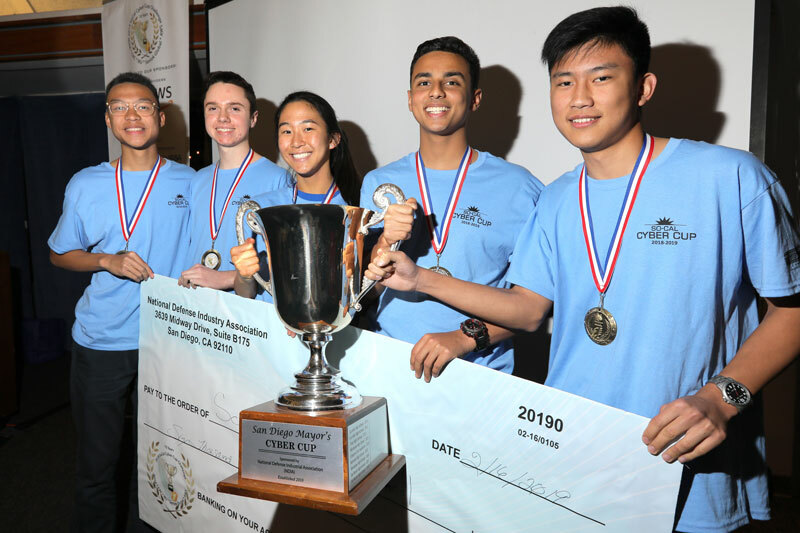 Scripps Ranch High’s team, the “Byte Sized Falcons,” is one of eight high school finalists and seven middle school finalists that competed for the title, a trophy and prize money for their school. According to the NDIA website, since the cup began, the organization has awarded more than $100,000 to help schools build their cyber programs. The Byte Sized Falcons are all seniors and all members of the Scripps Ranch High School Air Force JROTC program, led by Air Force Master Sergeant Ferdinand Toledo. 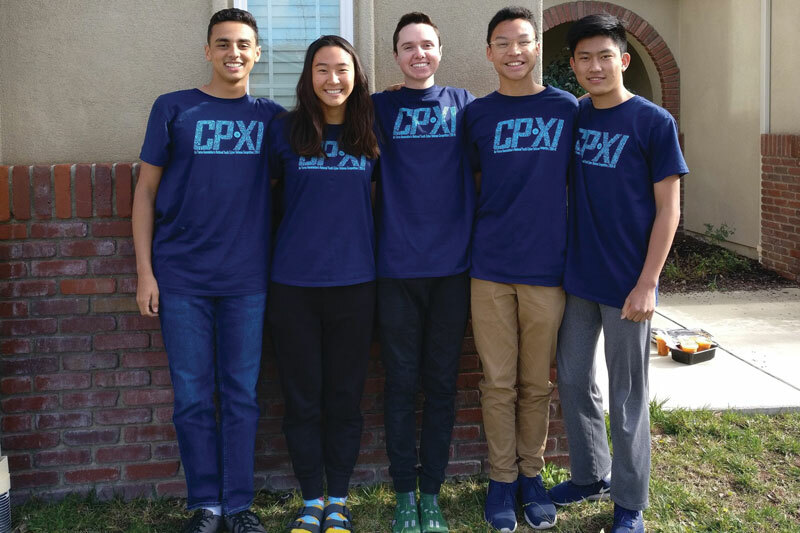 Team members include Evan Dicker, Shane Donahue, Valerie Ho, Brandon Nguyen and Alex Roh. For the last seven years, the team has competed in CyberPatriots, a youth cyber education program created by the Air Force Association to inspire K-12 students toward cybersecurity or other science, technology, education and math (STEM) fields. “We’ve qualified for nationals in CyberPatriots two years in a row,” Donahue said. This is the first time, however, that the Falcons have competed in the SoCal Cyber Cup. “Flags are hidden (throughout) the system, and you follow clues and answer the questions to find the flags,” he said. “Every time we answer a question correctly, we get a flag and the team with the most flags wins,” Nguyen explained. 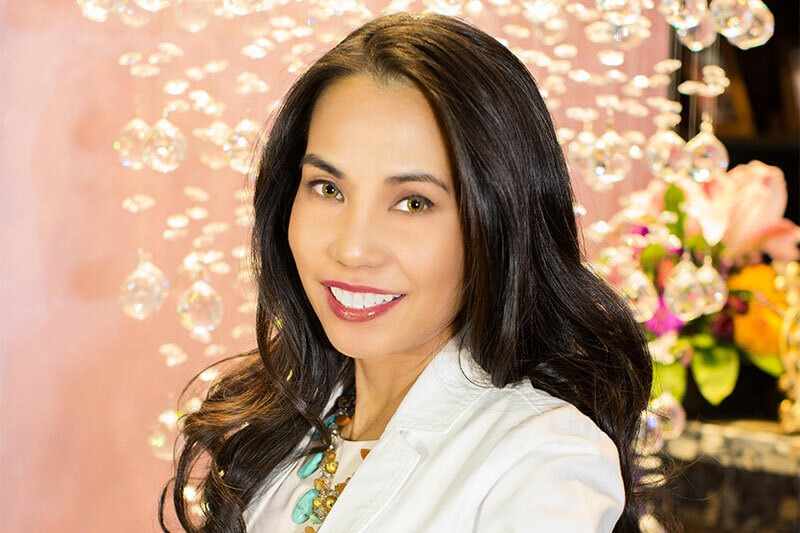 Donahue and Nguyen explained that the team would set up a board containing each challenge they are faced with, and each team member will pick one to go after. If someone had trouble with their question, others pitched in to help. 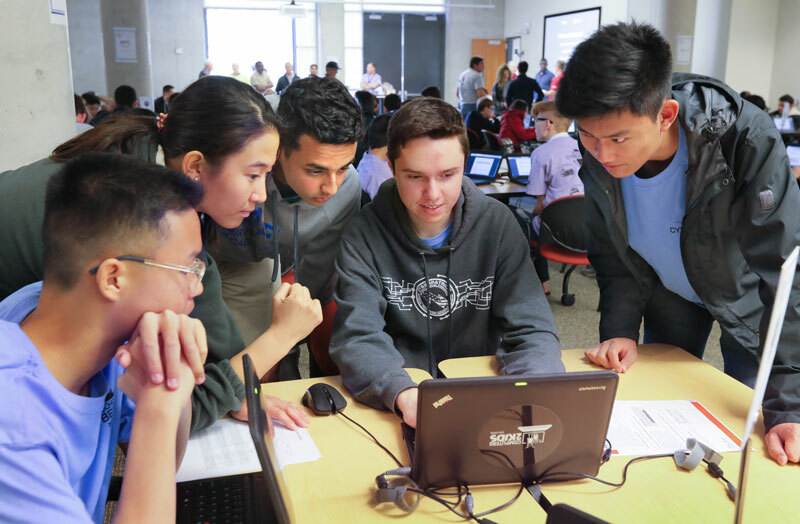 Throughout the competition students utilized the Haiku Cyber Range, a cloud-based technology provided with support from Amazon Web Services, to defend simulated systems that were under cyber-attack. Working in the cloud, teams from all over Southern California could access the cyber range and compete in practice, qualification and final rounds from any location. For the finals, the students got to work at the San Diego Supercomputer Center located at the University of California, San Diego. Donahue feels the competition helps him and his teammates sharpen skills they’ll use in their future cyber careers. Master Sergeant Toledo gives all credit for the Byte Sized Falcons’ success to the students. 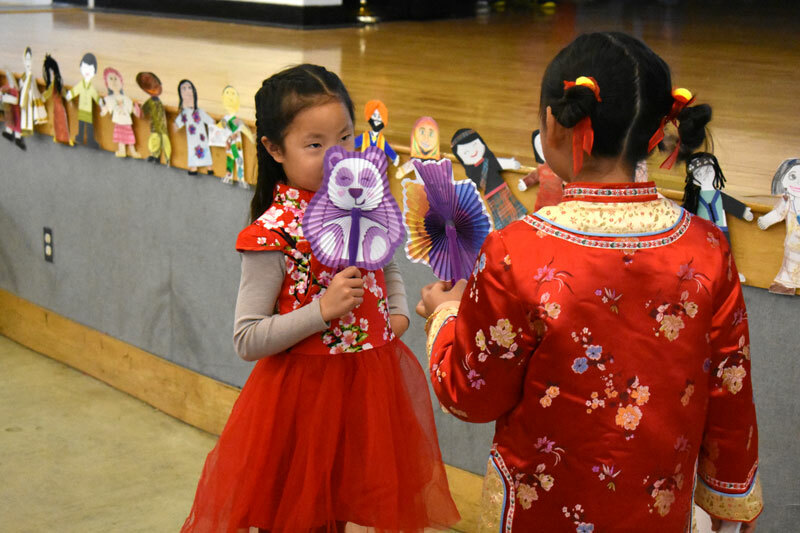 A full house was on hand at Ellen Browning Scripps Elementary School (EBS) for the school’s second annual International Night, held this year on Jan. 31. 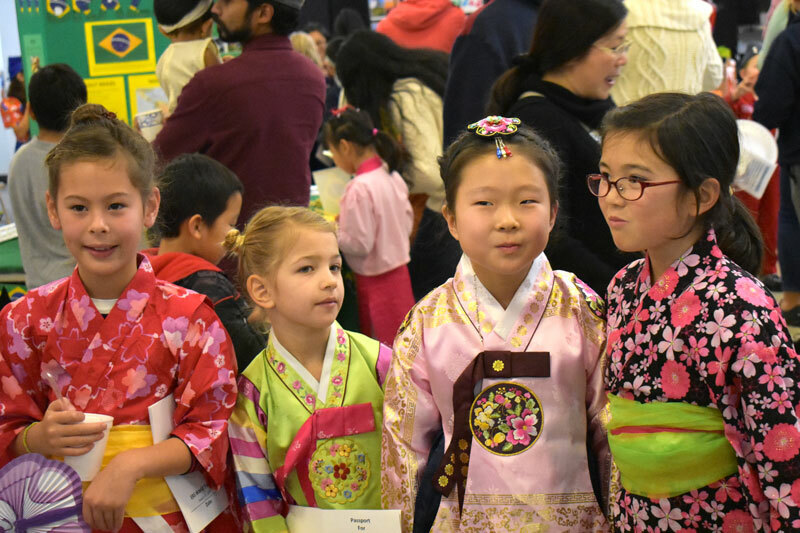 An estimated 200 attendees packed a multi-purpose room on the school’s campus to sample food and learn about the cultures presented at tables representing 15 different countries. Parents of EBS students provided the displays and staffed the tables. School Principal Liz Sloan stood in the middle of the growing crowd, proudly viewing the activities as guests continued to arrive on this wet and rainy evening. The soggy weather did nothing to dampen the spirits of those in the room, which was filled with smiles and pleasant chatter. Those responsible for chairing this event included Gail Faber, president of the EBS Academic Fundraising Partnership; Arwa Saif; Raquel Frutos; and Vann Tran. 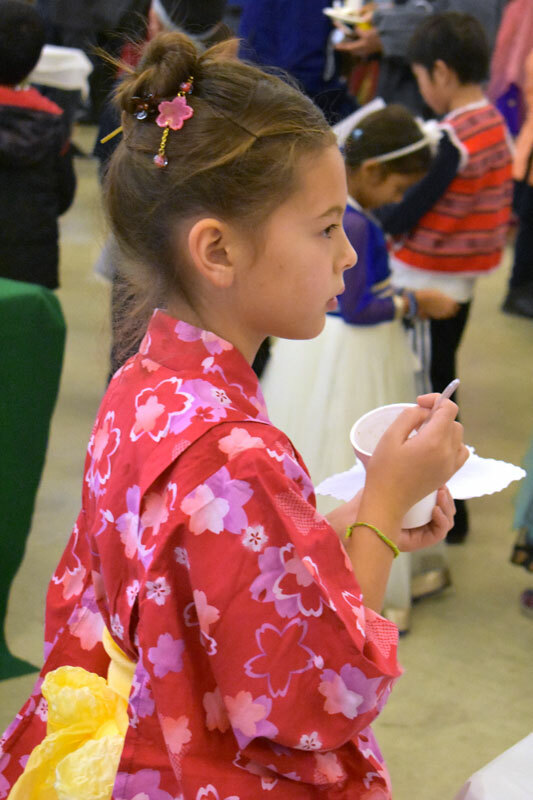 A large number of the students and parents in attendance were adorned in colorful international garb as the aroma of delicious food wafted through the room. 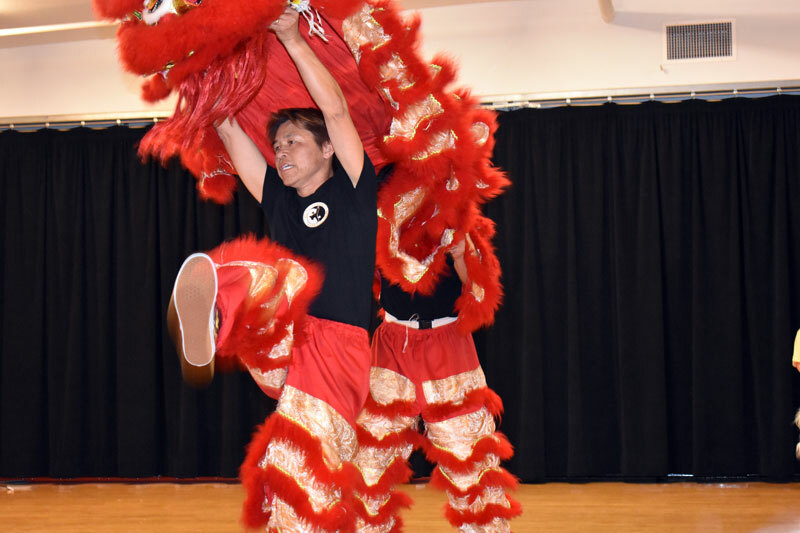 A handful of performers, including vivid dragon dancers, entertained the crowd, some dancing on stage and around the room. 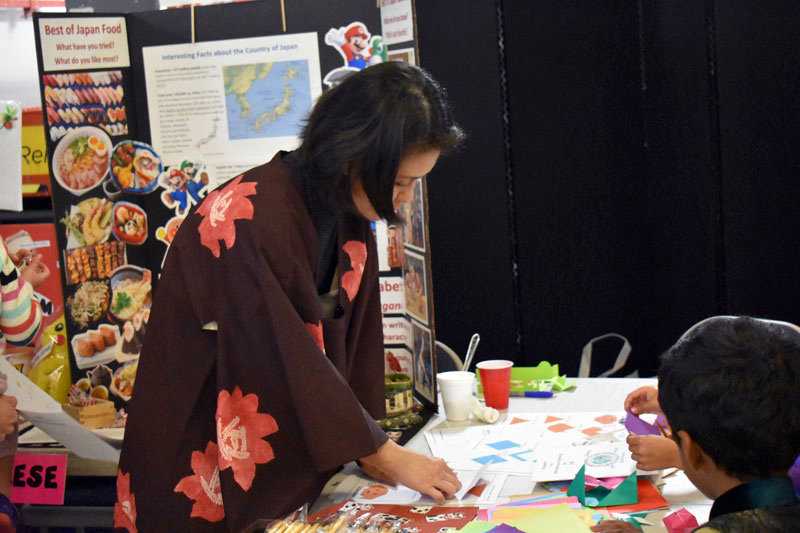 The International Night began in 2018 as a way to highlight the numerous backgrounds of students attending EBS, and to promote understanding of other cultures. “A parent came to me a year ago and asked for an International Night because there are so many different cultures at EBS,” Faber said. Most children enjoy playing with Legos, but a group of Miramar Ranch Elementary School fifth graders, known as the Aquabots, took the beloved interlocking bricks to the next level. The Aquabots were awarded first place in Strategy and Innovation for Best Robot Design in the First Lego League Robotics (F.I.R.S.T.) SoCal regional competition at Legoland on Dec. 9. The Aquabots are comprised of Joshua Frantz, Brady Nelson, Sasha Repkin and Liberty Morgan. 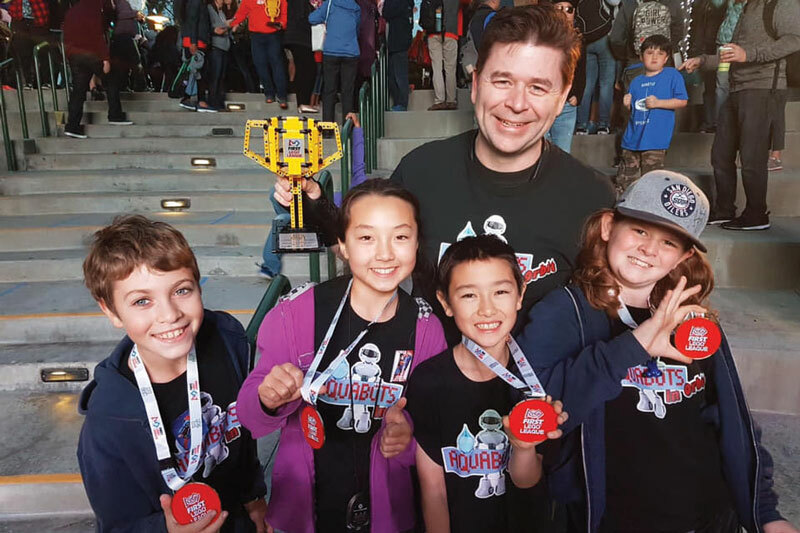 Aquabots coach and electrical engineer William Frantz spent his fourth year leading a team of four students, including his son, in creating a robot made of Legos to compete against 55 other teams from fifth to eighth grade. Prior to the regional competition, the Aquabots competed at a local San Diego high school against 15 teams. “It was our first year making it to regionals, so we were all really excited to win for best robot design. And our trophy was made of Legos!” Frantz said. The theme for the 2018 competition was “Into Orbit” – very fitting for the young innovators. Aside from designing, building and programming a robot, student participants had to identify and research a problem relating to space and space travel. Last year’s theme was Hydro Dynamics, which inspired the Aquabots’ name. Students were instructed to build and program a robot that could act autonomously by fetching, building or another type of physical action. Robots then had to move on a 4-foot by 8-foot mat that had graphics made for the robot to detect. Teams were judged on teamwork, cooperation, design and research. Frantz noticed the greatest challenges in this competition were keeping students inspired and working hard. Students spent several weeks planning, designing, building, and programming what would become their end result. “It’s hard for the students to stay motivated when they realize it’s actual work, but in the end, they love it and love Legos,” Frantz said. While this was their first time at regionals, Frantz and the Aquabots are still riding on the excitement of their first-place win. Frantz is especially awaiting another chance to compete and prove what else the Aquabots can bring to the table. “I know what to expect now. Compared to the first year we participated, we got the highest score, but receiving an award made me realize we’ve evolved and we can push that even further and definitely advance past regionals,” Frantz said. Frantz plans to compete again next year, but this time with more students. Families with students attending schools in the San Diego Unified School District (SDUSD) received email notification Friday, Dec. 21 regarding a major data breach. The breach also included information from some SDUSD staff members. According to the email, all important information was “potentially” exposed including addresses, Social Security numbers, contact information and other personal data. The breach might go back as far as January 2018. Today, SDUSD verified that the email notification was in fact valid and accurate. The unauthorized person or persons, perpetrators of this breach, gathered network access log-in information from staff and used the information to log into the district’s network services, including the district student database. This letter is in regard to an incident at San Diego Unified School District involving the security of you or your student’s personal data on the district’s information systems. We sincerely regret to inform you that, after completing a thorough forensics investigation, we have reason to believe your personal data may have been compromised through the access or use by an unauthorized individual. The unauthorized access resulted in the potential viewing or theft of the personal data of some students and staff members. The personal data potentially included social security numbers and other information listed below. The San Diego Unified School District has taken the steps necessary to eliminate the threat to your personal data and implement improvements to prevent such unauthorized access from happening again. We are sending this letter to provide you more information about the incident and what you can do to remain vigilant and protect your information. During October 2018, Information Technology professionals were investigating multiple reports of phishing emails, which were used to gather log-in information of staff members throughout the district. Staff determined an unauthorized person or persons, was gathering network access log-in information from staff and using that information to log into the district’s network services, including the district student database. Access to the student database offers complete access to personal identifying information, potential health information, scheduling and grade information. All staff members whose accounts were compromised had the security on their accounts reset immediately upon discovery. The breach is believed to date back to January 2018. Access to the systems noted also included the ability to alter data within those systems. We are not able to confirm, specifically, whether your personal data was viewed or copied from our systems as a result of this incident. We only know that the viewing or copying of some personal data was possible or occurred between January 2018 and November 1, 2018. Once aware of the threat to student and staff data, we promptly took steps to secure the system and identify the scope of the incident with the help of law enforcement. We have continued to implement and explore additional security measures, and continue to review and audit our practices to prevent this from happening again. We have also coordinated our investigation and response to the incident with law enforcement to bring the perpetrator(s) of this incident to justice. We have also provided notice of this incident to state authorities as required under applicable state laws. We highly recommend you review all credit information for all persons listed in the student or staff databases. Remain vigilant and report any fraudulent activity to your card-issuing bank, card issuer, or credit reporting agency as soon as possible. Regardless of whether or not you note any fraudulent activity on your card statement, we still recommend that you contact credit reporting agencies to notify them of the breach of your information. Should you find evidence of identity theft, you can contact San Diego Unified School Police Department to file a police report. To file a police report, contact your local Campus Police Officer, or call School Police Dispatch at (619) 291-7678. San Diego Unified School District Police Department is tracking all incidents of crime related to this network intrusion, and is investigating with the assistance of forensic computer and electronic crimes investigators. You may also contact the Federal Trade Commission or one of the credit bureaus for more information about how to protect your identity. You can place an identity theft/fraud alert, get credit freeze information for your state, or order a free credit report by calling any of the following credit reporting agencies at one of the phone numbers listed below or visiting their respective websites. Some states may charge a fee for such services. Under state law, a security freeze prohibits a credit reporting agency from releasing any information from a consumer’s credit report without written authorization. However, please be aware that placing a security freeze on your credit report may delay, interfere with, or prevent the timely approval of any requests you make for new loans, credit mortgages, employment, housing or other services. If you have been a victim of identity theft, and you provide the credit reporting agency with a valid police report, it cannot charge you to place, lift or remove a security freeze. In all other cases, a credit reporting agency may charge you a fee to place, temporarily lift, or permanently remove a security freeze. To place a security freeze on your credit report, you must send a written request to each of the three major credit reporting agencies listed above. The credit reporting agencies may also allow you to request such a security freeze online. The Federal Trade Commission (FTC) provides more information about how to protect your identity at either https://www.ftc.gov/ or https://www.identitytheft.gov/. You may also find additional information on any applicable rights under the Fair Credit Reporting Act. You can also contact the FTC by using the information below. 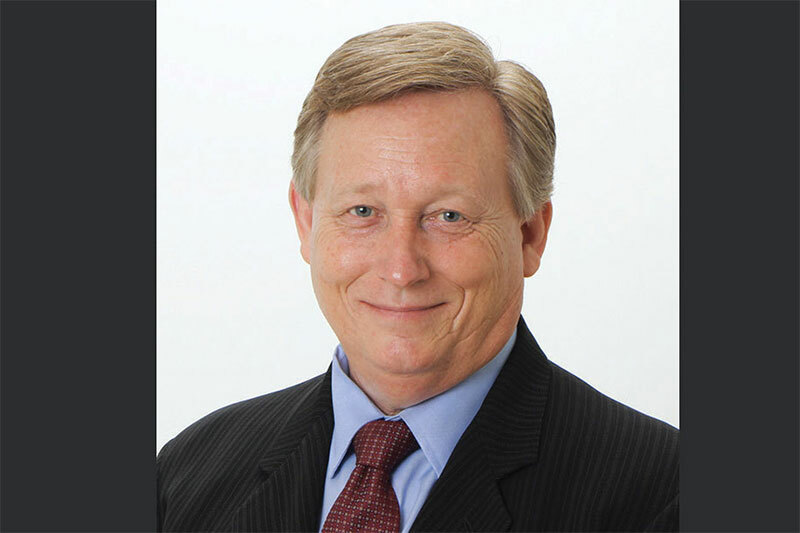 The San Diego Unified School District has alerted employees and families to an incident at San Diego Unified School District involving the security of their personal data on the district’s information systems. The district has reason to believe some employee and student personal data may have been compromised through the access or use by an unauthorized individual. Part of a “phishing” email effort, unauthorized access resulted in the potential viewing or theft of the personal data of some students and staff members. Roughly 50 staff members whose accounts were compromised had the security on their accounts reset immediately upon discovery. Families of students whose data may have been accessed have been contacted by the district. The breach is believed to date back to January 2018 and could impact as many as 500,000 students who were enrolled in the district between the 2008-09 and 2018-19 school years. San Diego Unified has taken necessary steps to eliminate the threat to personal data and has implemented improvements to prevent such unauthorized access from reoccurring. 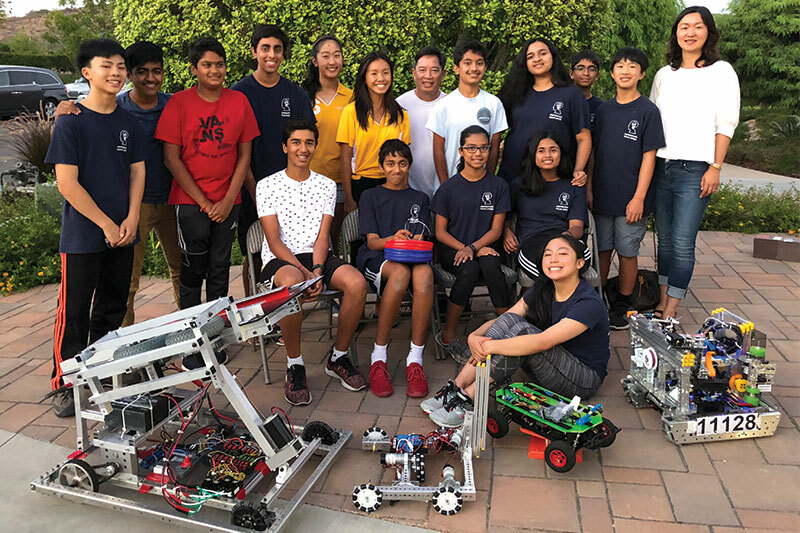 Students from multiple schools across Scripps Ranch and surrounding communities are learning valuable life skills outside of the classroom through a robotics program that fosters self-confidence, communication and leadership. For Inspiration and Recognition of Science and Technology (FIRST) is a non-profit organization that was founded in 1989 and has since gained worldwide recognition. While it is rooted in science, technology, engineering and mathematics (STEM) principles, Dean Kamen, the organization’s founder, explained that the organization’s programs are more comprehensive in terms of the lessons students learn. “FIRST is more than robots. The robots are a vehicle for students to learn important life skills. Kids often come in not knowing what to expect of the program nor of themselves. 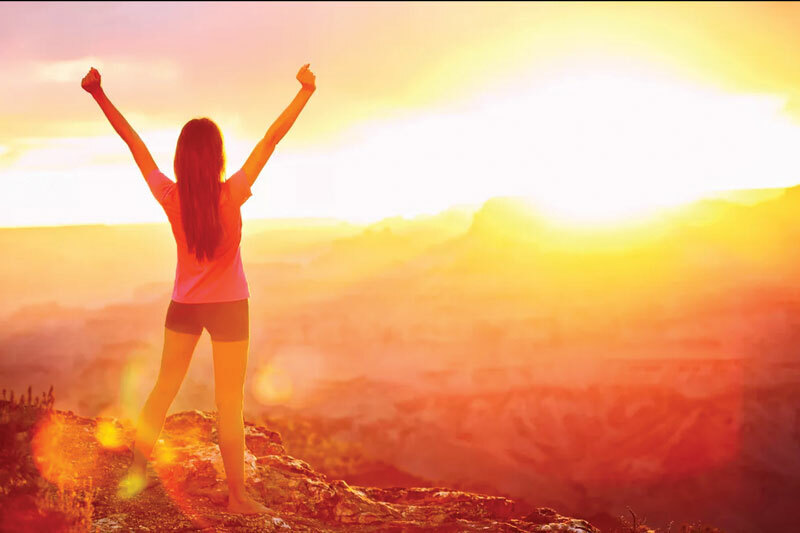 They leave … with a vision, with confidence and with a sense that they can create their own future,” according to the FIRST website. 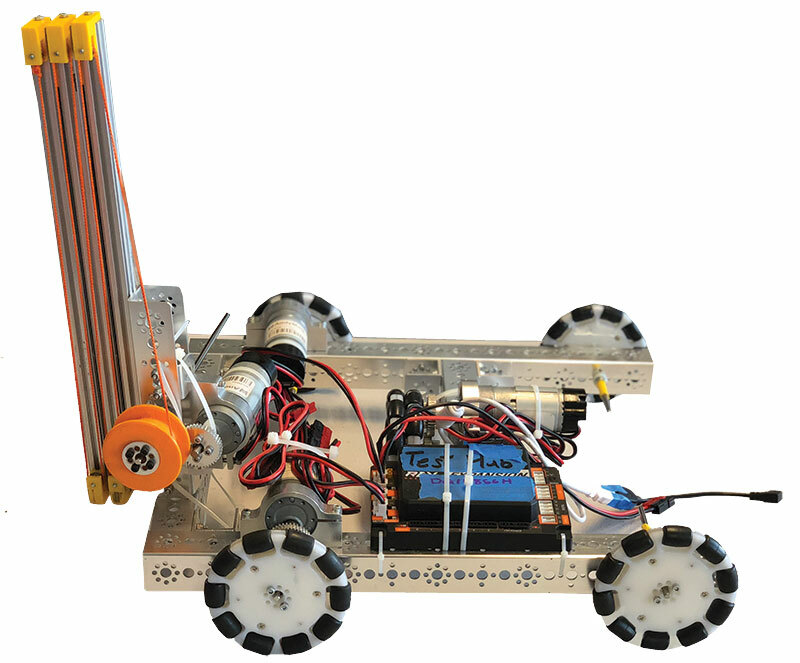 The organization has four levels of robotics programs, separated by both age and skill level. FIRST LEGO League Junior is designed to capture the curiosity of children in grades kindergarten through fourth grade, with motorized LEGO elements used as the primary robot construction material. FIRST LEGO League (FLL) also utilizes LEGOs for robot building and caters to students in grades four through eight. At the FLL level, teams have three primary focus areas: robot, which involves construction of a LEGO robot for competition; project, in which team members research a real-world problem then develop a solution to be presented before judges; and core values, which include discovery, innovation, impact, inclusion, teamwork and fun. Evan Edmonds is a fifth grader from Scripps Ranch who is part of an FLL team at The Cambridge School. FIRST Tech Challenge (FTC) is geared toward students in grades seven through 12, utilizes industrial building materials, and involves programing and more advanced processes. The most advanced group, FIRST Robotics Competition (FRC), is open only to high school students in grades nine through 12. Alex Szeto is a Scripps Ranch resident and is the FTC coach for the multiple award-winning team “Inspiration,” which is comprised of students from Marshall Middle School, Black Mountain Middle School, Scripps Ranch High School, Rancho Bernardo High School, Torrey Pines High School, Del Norte High School, The Cambridge School, and Design 39 Campus. Among the team members are his twin tenth graders, Colin and Mabel. Colin Szeto first expressed interest in the program after attending an FLL open house in second grade. “The best thing about FLL is that it uses LEGOs as a basis for teaching,” he said. Colin’s sister, Mabel, joined the program the following year. Although she acknowledged having had a preference for art over science at the time, she also found the LEGO aspect appealing. Mabel and Colin agreed that the values that FIRST teaches are what have kept them interested in and passionate about the program for the last eight years, even after advancing to the FTC level, which does not use LEGOs for robot construction. Passing on their knowledge in service to others is something that Mabel, Colin and many of their peers have dedicated countless hours to through volunteer mentoring. “My team teaches every week, 52 weeks a year,” Alex Szeto said. Whether hosting an open house, teaching a robotics summer camp, delivering a presentation at a local college or science museum, or virtually mentoring a FIRST robotics team in West Africa through 6 a.m. video conference calls, these students are committed to upholding the values imparted by the FIRST organization. Colin Szeto finds mutual benefit in having the opportunity to give back. “It changes lives,” he said. For more information about FIRST and its programs, visit firstinspires.org. 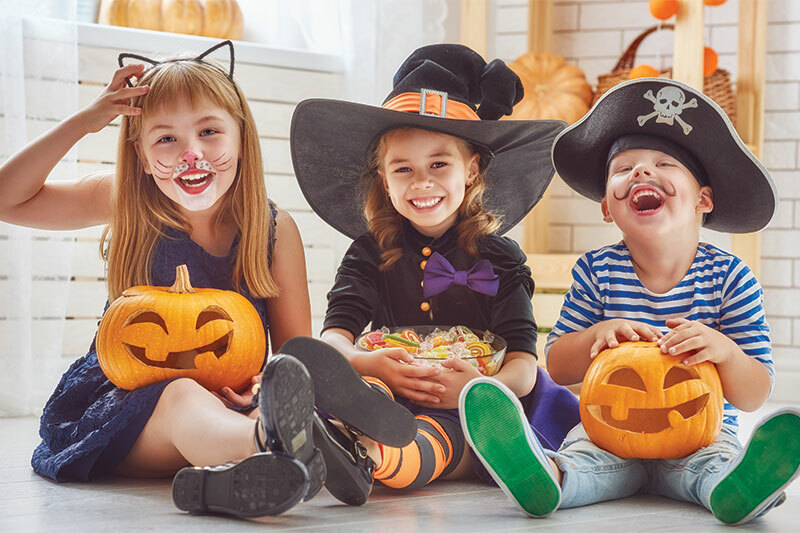 Families are encouraged to attend a fun-filled evening full of good food, music, dancing, contests and more at this year’s Dingeman Elementary School’s Boo-Bash fundraiser from 5:30 to 8 p.m. on Friday, Oct. 26 at the school campus, 11840 Scripps Creek Drive. There will be a bake sale, food trucks, a live DJ, a fire truck and many more fun things for to enjoy. Those attending are encouraged to wear their favorite costume. Dingeman students who have entered the contest will be competing to win a prize for the best pumpkin carving, as well as for the most creative trunk decorations for the Trunk or Treat area of the event. The season would not be complete without one more event: Dingeman Elementary will continue the Halloween Parade tradition again this year. 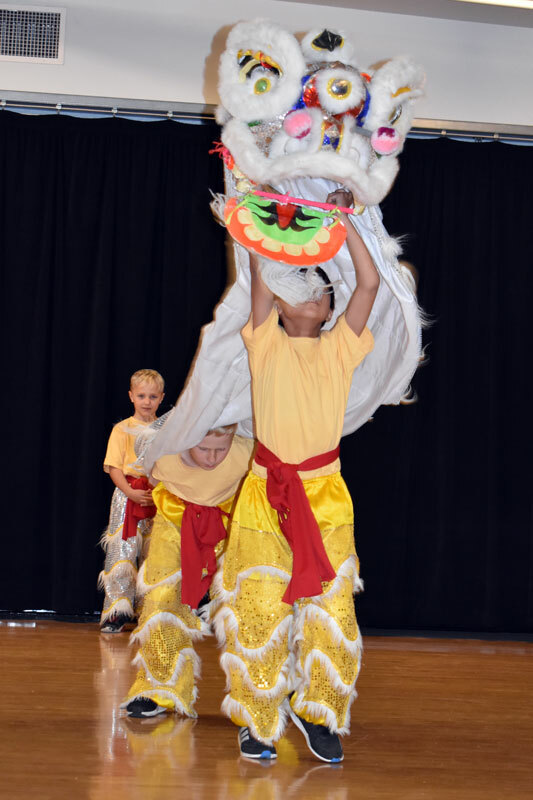 The parade for Dingeman Elementary students will take place on Halloween, Oct. 31. Classes will meet on the white top just after school begins at 8:45 a.m. Children are welcome to wear their costumes for the parade and will be asked to remove costumes after the parade. Students are permitted to parade with or without a costume. Masks can be worn during the parade only. Masks cannot be worn as students arrive to or depart from school. 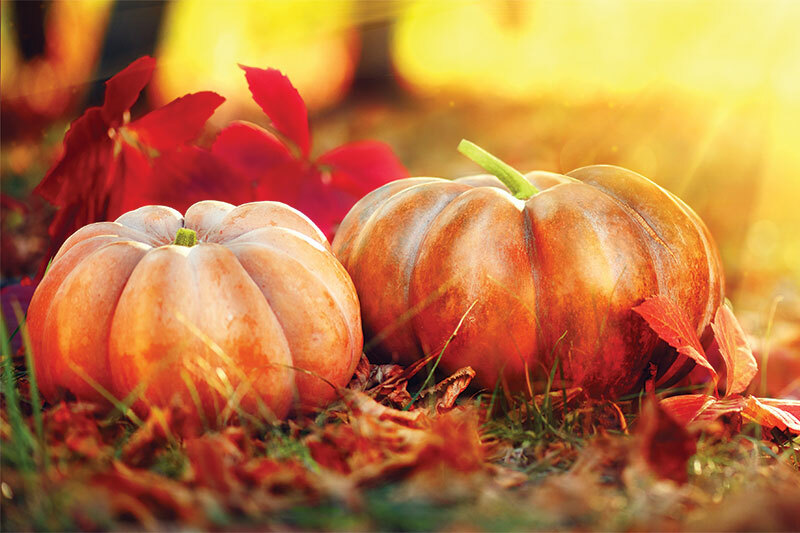 Ellen Browning Scripps Elementary (EBS) School’s Fall Festival will take place on the school grounds from 5:30 to 8:30 p.m. on Friday, Oct. 26. Organized by the EBS Academic Fundraising Partnership, this annual family-friendly event is free to attend but raises money for the school through a silent auction, food sales and games. Funds generated by the event are used to pay for vital resources and services affected by budget cuts over the last few years. Activities at the Festival include a pumpkin decorating contest, a bake sale, costume parade, face painting, and a cakewalk. Food vendors will feature Mexican, barbecue, burgers, Jamaican and Filipino flavors. 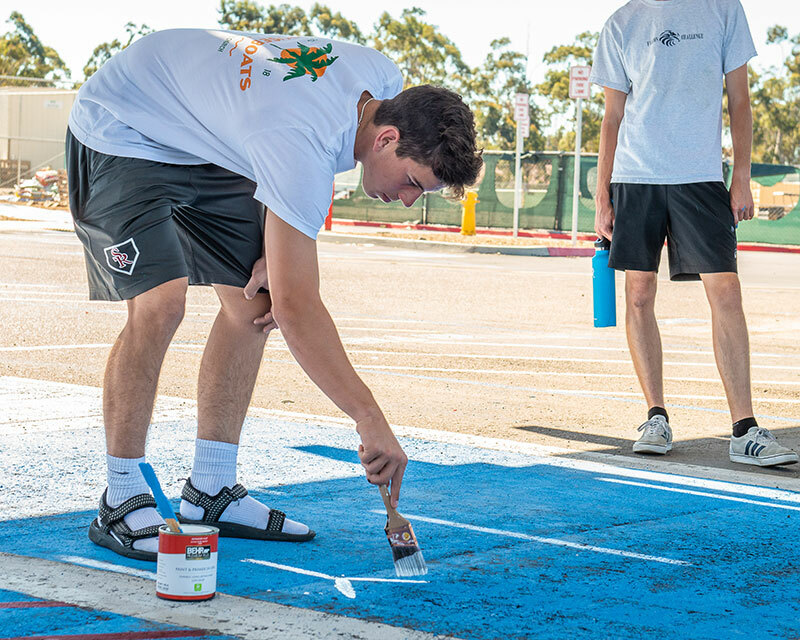 More than 100 seniors at Scripps Ranch High School (SRHS) gathered in the school’s front parking lot over the course of three days this month to take part in a long-standing school tradition. 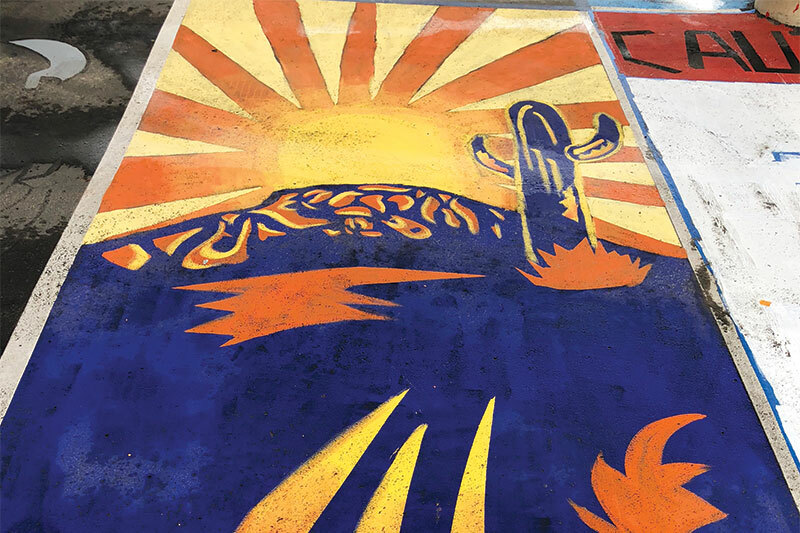 Each fall, designated parking spots are auctioned off to the highest bidders in a school fundraiser, offering seniors an opportunity to purchase, personalize and maintain ownership over their very own parking space for the duration of the school year. 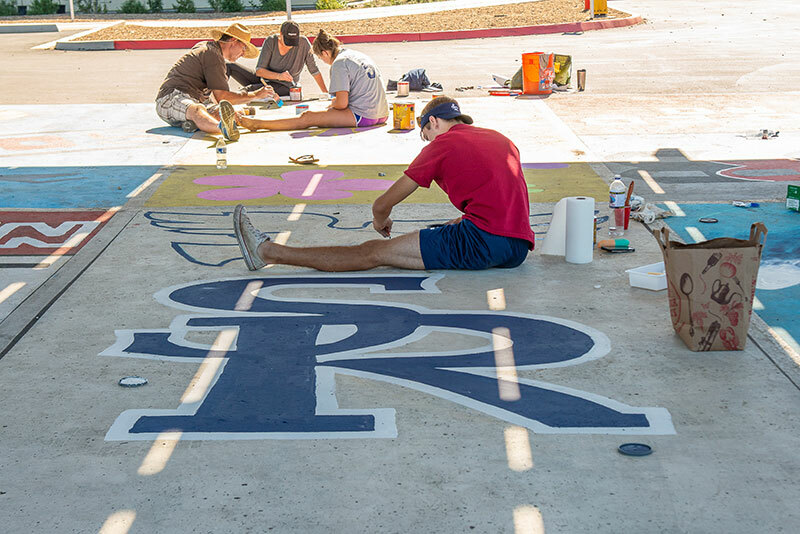 While all SRHS students with a parking permit are allowed to park on campus, these dedicated spaces are a privilege reserved exclusively for the senior class. 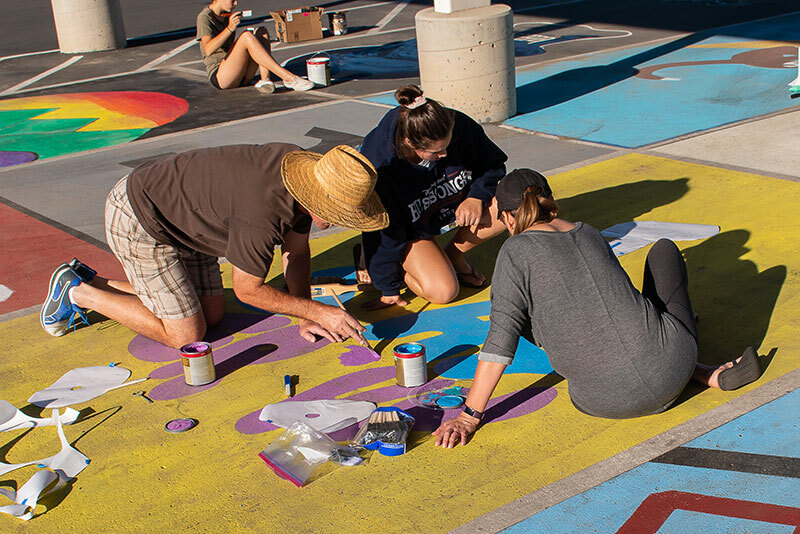 In addition to being a guaranteed, consistent parking spot every school day, these spaces also allow students an opportunity to showcase their creativity and demonstrate their individuality. Designated painting days were held after school on Oct. 8 and 10, as well as the morning of Saturday, Oct. 13. 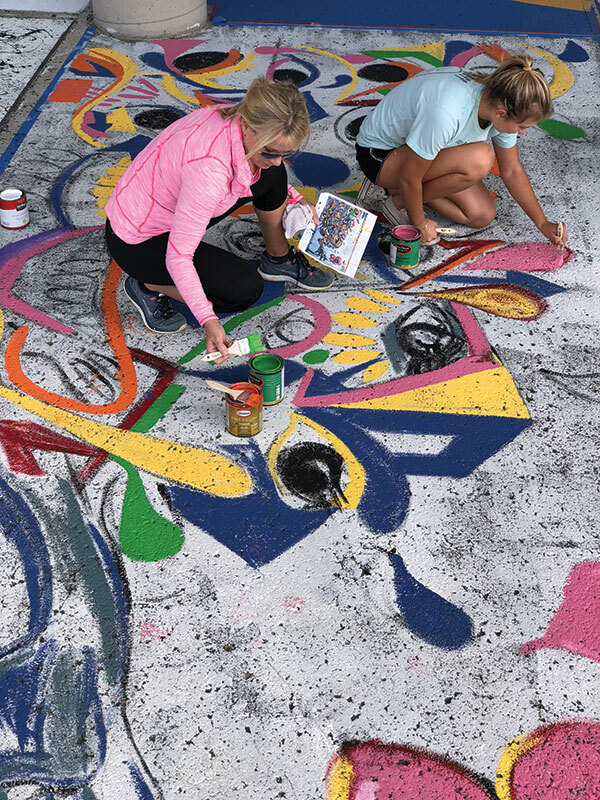 During these specified times, students who purchased a space were invited to bring their own materials and any desired helpers to paint and personalize their spots, while enjoying a festive atmosphere. Grady Dok is vice president of the Associated Student Body (ASB) senior class, the student group responsible for the fundraising activity. “We supply music and a good time, and everyone has fun with their friends,” he said. Indeed, on those designated painting days, the school parking lot was abuzz with energetic teenagers, happily hard at work painting their spaces – some solo and singularly-focused on the task-at-hand; others laughing with friends as they discussed their designs; and still others making it a family affair, with parents joining the project. 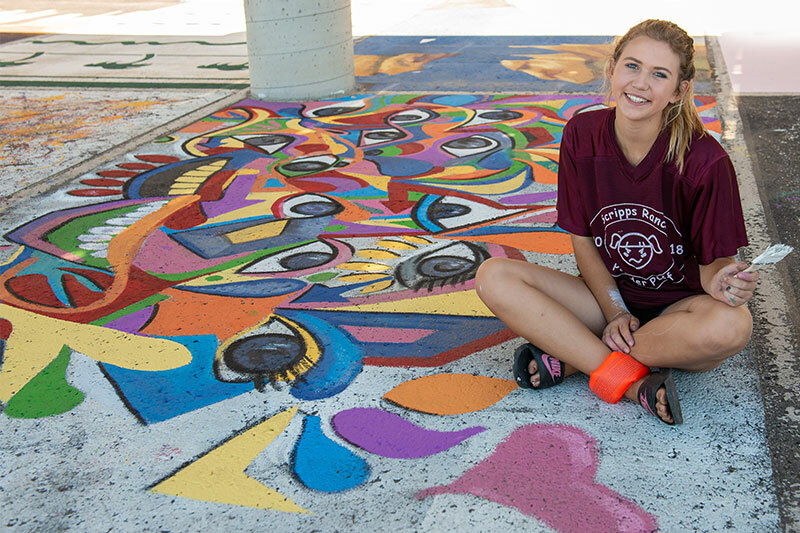 Alexis LoVuolo worked with her mother on painting a geometric design that featured the letter “A” in the center. “My mom and I are like best friends so we always do everything together,” she said. Meanwhile, Nancie Helders, a senior at SRHS who has long had a passion and talent for art, took the project on as a solo artist. Helders explained that she had never before painted on such a large surface so it did present some challenges, but she was excited to be participating in the activity. “When I found out about [this activity] ... 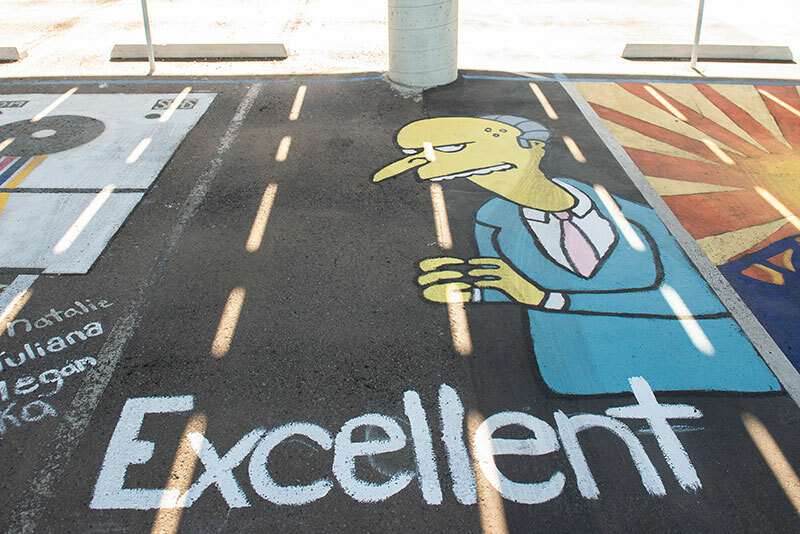 I got excited that I could personalize a spot, make it mine and leave my mark for the year,” she said. While perhaps helpful, artistic ability is not a requirement for participation, according to Amber Almond, senior class secretary. 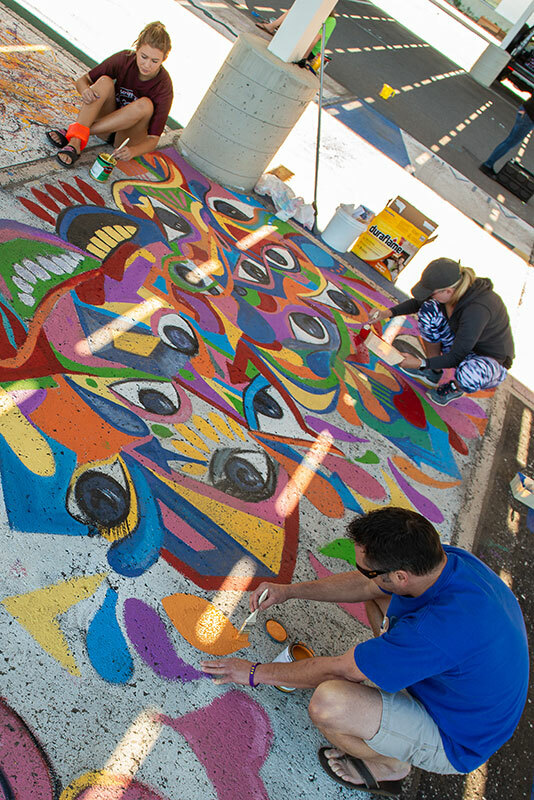 “It’s still fun to come out and paint and make your spot look as good as possible,” she said. 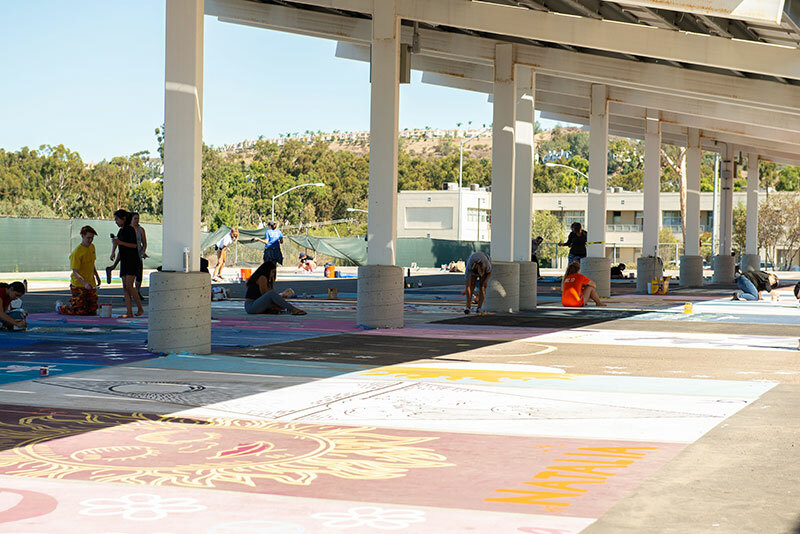 Parking spaces were made available for purchase through an auction that was held on campus during lunch on Sept. 20-21, with a re-auction for unclaimed spaces held on Sept. 24. Interested students were required to sign up in advance to participate in the optional activity, and only those registered were admitted to the function. Bidding for each space started at $40, with a minimum increment of $5 required to outbid the previous bidder. LoVuolo reported that the most expensive spot this year sold for around $400. According to ASB advisor Lauren Ruiz, the median price of the 111 spots auctioned this year ranged between $150 and $300. 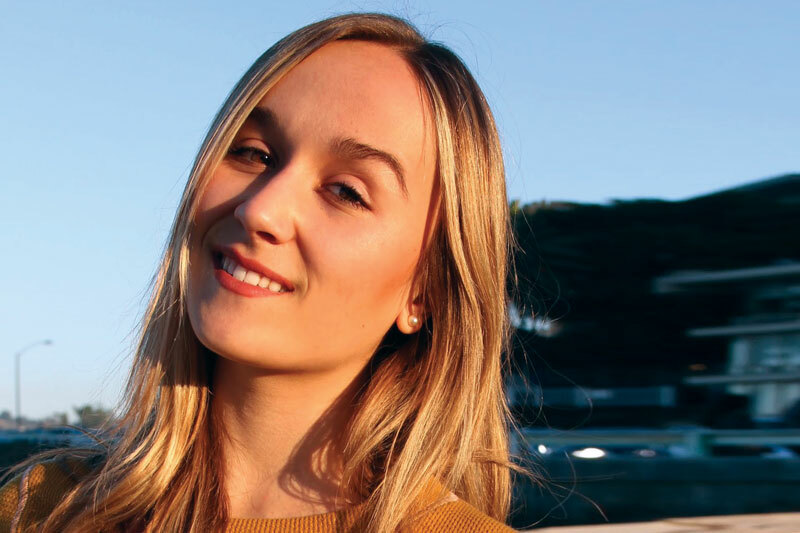 Alexandra Kotsos, senior class president, explained that the spaces that generally command a higher selling price are those that are in the shade and located nearest the exit. For many whose bids approached the higher end of the range, knowing that the funds would benefit the senior class helped make it feel more worthwhile. Gina Lane is a parent whose daughter, Juliana, purchased a space. “It’s hard to justify spending a lot of money on a parking spot unless you know it’s going back to the students and they will get the value in return,” she said. For some, that value goes well beyond the funds raised for the senior class. “It gives students a sense of school spirit and camaraderie,” Lane said. Likewise, for Helders: “I’m doing what I enjoy,” she said.